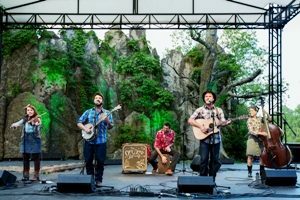 The Minnesota Zoo and the Okee Dokee Brothers are proud to announce the release of a new single celebrating the Minnesota Zoo’s mission to save wildlife. 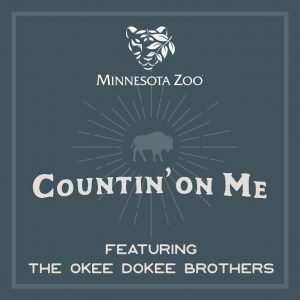 The Minnesota Zoo commissioned “Countin’ on Me” from the Grammy Award-winning duo to serve as its conservation theme song. The lyrics poetically communicate our shared responsibility to help save wildlife, and reference three species native to Minnesota that the Minnesota Zoo has restored or is working to restore in the wild – bison, butterflies and trumpeter swans. The commission developed from a collaboration between the Minnesota Zoo and the Okee Dokee Brothers, who share a passion for nature and a mission to encourage kids and families to explore the natural world. These common values are at the heart of their collaboration, which began in July 2015 with the opening of a nature play area and continued with several special appearances at the Minnesota Zoo by bandleaders Justin Lansing and Joe Mailander. The single, “Countin’ on Me,” will be available for purchase on iTunes beginning March 16. All proceeds from the purchase of the single will support the Minnesota Zoo and its wildlife conservation efforts. Justin and Joe will debut the single live at the Zoo during a special animal encounter on Saturday, March 18. Their appearance is free with Zoo admission, but due to space limitations, RSVPs are required. Learn more at www.mnzoo.org/okeedokeebrothers. As kids in Colorado, Justin and Joe grew up together exploring nearby creeks, trails, woods and rivers. Twenty years later as the Okee Dokee Brothers, they are still roaming the outdoors together, but with a mission and a couple of guitars in their packs. Now based in Minneapolis, the Grammy Award-winning folk singer-songwriters are advocates for adventure. The Minnesota Zoo is a year-round destination located in Apple Valley, just minutes south of Mall of America. The Zoo’s mission is to connect people, animals and the natural world to save wildlife. For more information, call 952.431.9500 or visit mnzoo.org. The Minnesota Zoo is an accredited member of the Association of Zoos and Aquariums (AZA) and an institutional member of the World Association of Zoos and Aquariums (WAZA).